This post covers two scenarios. With this setup I have a Windows 7 VM (the server) on the same network segment as the client PC which will be taking over any work I would normally do on my Windows XP box. My existing XP box is used for any development that is easier to do on a Windows machine than a *nix machine. 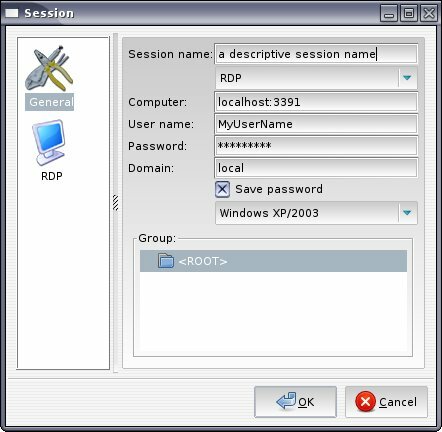 Is by way of RDP session tunneled through SSH. SSH link being established from one of my Debian eeepc’s (The computer I use most of the time) to the existing Windows XP machine. Used OpenSSH for the existing Windows XP machine. http://sshwindows.sourceforge.net/ which is no longer supported. Couldn’t get key pair authentication working though when I set it up. I thought I’d give OpenSSH a try on the Windows 7 machine and see how far we could get. Once followed all directions in the ssh readme.txt and comparing with the setup on my existing Windows XP box. The OpenSSH Server service wouldn’t start. Tried everything I could think of and still couldn’t get the service to start. So going on some others advise, decided to give copSSH a try, as it is an implementation of OpenSSH, but currently being maintained. This worked out well and was a very easy setup. The version of CopSSH used for this was 4.1.0 from here. Create a file in your ~ dir. TunnelToWin7Box for example, and put the following command in it. Add a Custom Application Launcher to the drawer that points to the TunnelToWin7Box file. The first port there can be any port not currently in use. The second port is the port that RDP listens on in Windows. You also need to add an inbound rule to open port 22 or a port of your choosing on the Windows Firewall. Also close the Remote Desktop port TCP 3389 on the Windows box. If the server you are trying to tunnel to is behind a NAT and not on your network, I.E. you are trying to tunnel to your work machine from home for example, There is a little more involved in setting up the firewall rule and a change to the sshd_config. You’ll need to add an inbound rule. I called it SSH. In the Programs and Services tab… selected “All programs that meet the specified conditions”. For the Service Settings, only one that would work was “Apply to services only”. I thought it would be best to select only the ssh service, but this wouldn’t allow SSH in. General tab just had Enabled on. Computers tab was untouched. Users and Scope was untouched. Advanced tab only needed to select Private check box. “Protocols and ports” tab Protocol type is TCP, Local port is port 22, Remote port is All Ports. Edit the C:\Program Files (x86)\ICW\etc\sshd_config as an administrator. Or uncomment it and set to yes rather than no if it already exists. The port is the port that your network admin has setup for you to forward to the machine you want to tunnel to. When I run the command to try establish the tunnel I was getting an error message. I made a post here. So I un-installed copSSH and re-installed a few times trying different things. and deleted the OpenSSHServer service using the “sc delete OpenSSHServer” command in cmd.exe shell running as administrator. Installed again using all defaults. It appears as even though SSH gives the message that it won’t tunnel, if you then try and open the port forwarded RDP session, it works. In saying that, sometimes it didn’t work. This happens if you click the command launcher more than once and you end up with more than one tunnel established. In which case you just kill one of them and your away laughing. I’ve been using Gnome-RDP for my RDP sessions. Set the session up to look like this. Copy the existing public key I used for SSHing to other servers to MyWindows7Box. This is considerably more difficult if you want to scp the key to a NATed machine on another network. Read the likes of this if your interested. It’s the public key, so sniffing it is not such a big deal. Make sure you have the Colan at the end of the above command, else the file won’t be copied. You may receive a prompt that the authenticity of the server you are trying to scp to can’t be established and you want to continue. I didn’t get that with scp’ing to MyWindows7Box because my known_hosts already knew about MyWindows7Box from my previous OpenSSH install. I copied the authorized_keys file to authorized_keys-OrigWithInstall (rename). and edited ~/.ssh/authorized_keys with nano. Deleting the public key. When I tried to open this file in file explorer, it didn’t appear to have been edited. the public key needs to be put into the list of authorized clients that may connect to the ssh daemon. Can do this using the Bash shell that comes with copSSH. You can now delete the id_rsa.pub on the target machine. With scenario two, there were a few differences. I’m thinking some of which were probably due to a more recent version of CopSSH (4.1.0). For starters there was no authorized_keys file anywhere, so I created one (in C:\Program Files (x86)\ICW\home\User\.ssh). As stated above, it’s considerably more difficult to scp the id_rsa.pub from a remote pc to a NATed server. ran the cat command shown above. I think a service restart is required to reload changes. When you make changes to the sshd_config, you’ll need to do them as an administrator (similar to how you would on a *nix system as root). This site has example of setting up SSH to be even more secure by modifying the sshd_config. There are many items on the net that show and describe the options when it comes to the sshd_config.